Tridens flavus (L. ) Hitchc. Culms: Erect, solitary, stout, slightly flattened below, glabrous. Blades: Flat, 8 to 28 inches long, less than 1/2 inch wide, uppermost shorter, mostly glabrous, midrib prominent near base; margins rough; tips tapered to narrow points. Sheaths: Upper sheaths shorter than internodes, lower sheaths overlapping, flattened, mostly glabrous, throat and collar pubescent. Inflorescences: Panicles, open, terminal, 6 to 16 inches long, purplish or reddish; branches slender, wavy, to 10 inches long, ascending or spreading, drooping at maturity, axils pubescent. 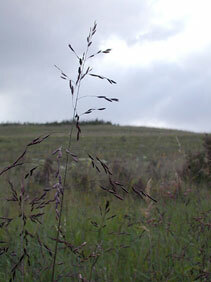 Spikelets: 1/4 to 1/3 inch long, 3-8-flowered, purplish green; awns absent. Habitat: Prairies, old fields, and open woods. Forage Value: Livestock graze early growth purpletop. It decreases with overgrazing. Comments: Tufted. Purpletop can be identified by the distinct pubescence inside and outside the sheath at the collar. The inflorescence is somewhat oily and sticky, which causes dirt and dust to adhere to the seed heads and branches.